For three years in the mid-1990s, kids across the country tuned in every day but Sunday to watch five teenagers from Angel Grove transform into superheroes who defeated giant bad guys using dinosaur robots called Zords. The original version of Mighty Morphin Power Rangers is still beloved by many, and will be getting a movie reboot in 2017. Here are a few things you might not have known about the original series. It’s morphin time! 1. IT WAS BASED ON A POPULAR JAPANESE SHOW. Super Sentai was created by Toei Studios in 1975. The first iteration lasted two years, but afterward, the Rangers got a new theme every year. Japanese kids got to watch Five Rangers; Turbo Rangers; Goggle Five Rangers; Battle Fever J Rangers; Ninja Rangers; and King Rangers. 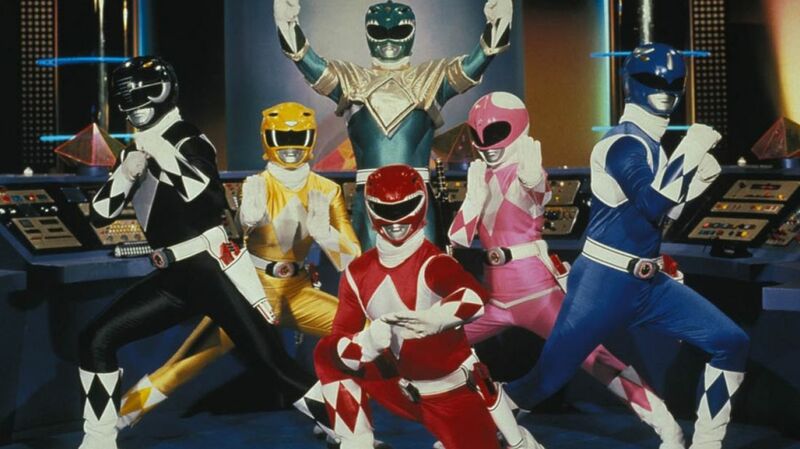 America’s Power Rangers were based on the Beast Rangers of the Dinosaur Corps, the 16th version of Toei’s Rangers. According to the Los Angeles Times, Toei chose that theme “to ride on the dinosaur fever generated by Jurassic Park.” The characters and their likenesses were licensed to Saban Entertainment. 2. IT TOOK SEVEN YEARS TO SELL THE SHOW. Before he was the executive producer of Power Rangers, Haim Saban was a concert promoter, a theme song writer, and the producer of NBC’s Kidd Video (like MTV, but for children). On a trip to Japan to meet with animation studios, he discovered Super Sentai. “He said to me, ‘We gotta do something with this. It's so big in Japan, but nobody else around the world is looking at this stuff,’” Shuki Levy, the show's executive producer (who wrote and scored the pilot episode), told Complex. But when Saban was shopping around the show around, no one was interested. “For seven years I've schlepped this thing, and everyone said, 'Go take a pill or something,' because this is too weird—guys in spandex suits and dinosaurs,'' Saban said in 1993. Then he met with Fox Children’s Network president Margaret Loesch, who definitely was interested—and the rest is history. 3. IT WAS ORIGINALLY CALLED DINO RANGERS. 4. AMY JO JOHNSON HAD DECIDED TO LEAVE L.A. RIGHT BEFORE SHE GOT CAST. 5. THE ACTORS WHO PLAYED THE RANGERS WERE FOUND IN OPEN CASTING CALLS. 6. THERE WAS A DIFFERENT YELLOW RANGER IN THE PILOT. Johnson’s audition group also included Audri DuBois, who was cast as the Yellow Ranger. The original Trini, Jones told Fusion, was “a really tough martial artist, she was really strong. She was Latin. Then she asked for more money, and after the pilot she got fired, and then they hired Thuy Trang.” You can watch the original pilot above. 7. THE ACTION SEQUENCES CAME FROM THE JAPANESE VERSION OF THE SHOW. 8. THE ACTOR WHO PLAYED ZORDON WAS FILMED ONLY ONCE. David Fielding told Complex that his inspiration for Zordon (originally called Zoltar) was “a mythical character like Zeus or Oden, so that's the voice I was projecting when I was doing the audition.” He auditioned against just one other person, and, after auditioning with the actors cast as Rangers, booked the role. But instead of a regular gig, he was filmed just once for a couple of hours. “For budgetary reasons they never filmed the character again,” Fielding told The Huffington Post. “They shaved all my hair off and glued my ears back. And used makeup to make my eyebrows stand out, and then painted the top half of my chest and shoulders green. I sat in front of a green screen while they filmed me because they were just going to use my head and that was it. ... If you watch the character in the show, his movements and his actions seem to be really sort of out of sync with everything.” The rest of his time playing Zordon was spent in a recording studio. 9. THEY FIRED THE WOMAN WHO VOICED RITA REPULSA—THEN RE-HIRED HER. 10. THE GREEN RANGER WASN’T SUPPOSED TO STICK AROUND. The five original Rangers had already been cast when Jason David Frank came in to audition for Tommy, the Green Ranger—a character that was initially only supposed to appear for a few episodes. But the fans loved him, and sent letters to Saban saying so—so Saban brought him back. Frank would go on to play the White Ranger and appear in 217 episodes of the show. 11. THE SHOW WAS CRAZY SUCCESSFUL. Mighty Morphin Power Rangers began filming in September 1992 and shot for six months; the show wouldn’t debut until August 28, 1993, and when it did, it was a massive hit: By the end of 1993, the show—which aired six days a week—was the top-ranked weekday show for kids aged two to 11, and in November it took the top spot for six- to 17-year-olds on Saturday mornings as well. “The Power Rangers have captured the highest Nielsen ratings for a network children's TV show,” The Baltimore Sun wrote in December 1993. 12. THE RANGERS’ COMMAND CENTER ACTUALLY EXISTS. The exterior of Zordon’s lair is actually a building at the American Jewish University’s Brandeis-Bardin Campus in Simi Valley, California. Dubbed the “House of the Book,” it was designed by Sidney Eisenshtat and opened in 1973. 13. THE ACTORS CAME UP WITH THEIR OWN FIGHT SEQUENCES. 15. ...BUT THEY WERE NOT PAID WELL. Trang, Jones, and St. John didn’t return for the third season—which would end up being the last for this iteration of Rangers. They were replaced by Karan Ashley, Johnny Yong Bosch, and Steve Cardenas, who donned the Yellow, Black, and Red Ranger uniforms, respectively. 16. THE ACTORS WERE CALLED INTO WORK RIGHT AFTER THE DEVASTATING 1994 LOS ANGELES EARTHQUAKE. While Johnson agreed that it was crazy, she said that “We were all so young and alone in California … all these people were our home, basically, so it was kind of nice to all gather on that morning ... just to make sure that everybody was OK.” They didn’t shoot an episode that day, though, because the crew didn’t show up. 17. THE THEME SONG WAS INSPIRED BY INSPECTOR GADGET. 18. BRYAN CRANSTON VOICED TWO VILLAINS. 19. KIDS WENT NUTS FOR THE TOYS. In December 1993, Entertainment Weekly declared Power Rangers toys “the hottest toys of the Christmas season.” Nearly a year later, the craze hadn’t let up: According to an August 1994 Newsweek article, “Toys that normally retail for $10 are often scalped in the classifieds for as much as $65 ... The mania has prompted Toys 'R' Us to limit sales; some stores will sell only one action toy to a family. ‘Other than the Cabbage Patch craze of '83,’ says the company's chief executive, Michael Goldstein, ‘I've never seen anything like this.’” These days, people smart enough to hold onto their action figures and Zords can make a pretty penny on eBay. 20. THE SERIES WAS BANNED IN OTHER COUNTRIES. In 1994, the series was outright banned in New Zealand, dropped from two Canadian TV stations and edited on others for being too violent. It was also banned in Malaysia in 1995, but for another reason entirely—because authorities though that “the use of the word ‘morphin’ could have a ‘negative influence on children’ who associate it with the drug ‘morphine,’” according to ITN. The word was eventually censored out, and the show was allowed back on the air. 21. THERE COULD HAVE BEEN A BULK AND SKULL SPIN-OFF. 22. THE SCRIPT FOR THE MOVIE WAS WRITTEN AS THE FILM WAS BEING SHOT. Mighty Morphin Power Rangers: The Movie filmed for five months in Australia and, like the show, was non-union. Unlike the show, it didn't feature any recycled Japanese footage. The film—which almost starred future Law & Order: SVU star Mariska Hargitay, by the way—was released in 1995 and made nearly $66.5 million worldwide. 23. THERE ARE 20 SERIES OF THE AMERICAN VERSION OF POWER RANGERS ... SO FAR. Much like its Japanese inspiration, Power Rangers spawned many iterations, including Power Rangers In Space, Power Rangers Ninja Storm, and Power Rangers Jungle Fury. The total number comes to 20, which doesn't include Mighty Morphin Alien Rangers, a miniseries that ran between the original MMPR and Power Rangers Zeo, or the confirmed 2016 reboot, Power Rangers Dino SuperCharge.